Saturday was World Nutella Day and each year I celebrate by making a dessert made with the oh so good chocolate-hazelnut spread. 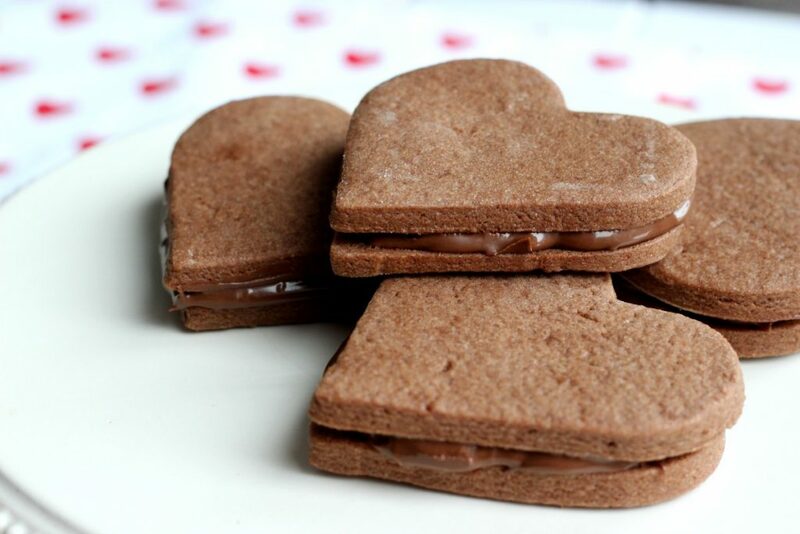 This recipe uses two chocolate sugar cookies with Nutella sandwiched in between. My assistants, Emily and Evan, were very excited about the idea of having Nutella with their cookies. Baking with a 3 year old and 4 year old is always interesting. Between ensuring that they weren’t breaking the eggs they were “babysitting”, telling Evan repeatedly that “no it’s not time to eat the cookies yet, we haven’t even mixed the dough yet” and soothing Emily after she actually did break the egg and had yolk all over her, the chair and the floor….well let’s just say that it’s a miracle the cookies got done. Nevertheless, they turned out great! Even if you think about opting out of using the Nutella, the cookies were delicious on their own. In the bowl of an electric mixer, cream the butter and sugar, on medium speed until light and fluffy. Add the eggs, vanilla extract. Beat until combined. In a separate bowl combine the flour, cocoa powder and salt. Add the flour mix to the creamed sugar and butter. Beat until the dough stiffens then roll out onto a floured surface and knead by hand until the dough is smooth. Divide the dough in half and wrap each half in plastic wrap. Refrigerate for about one hour. This allows the dough to firm up for rolling. Preheat oven to 325°F. Line baking sheets with parchment paper or, if you have them, non-stick baking mats. Remove half of the chilled dough from the refrigerator and, on a lightly floured surface, roll out the dough to 1/4 inch thick. Using your favourite cookie cutters, press out the shapes and transfer the cookies to a baking sheet. Bake the cookies for about 15 minutes. Remove from oven and let them cool for a few minutes before transferring them to a cooling rack. Once they have cooled completely, take a tablespoon of Nutella and spread onto the underside of one cookie. Take another cookie and press overtop the Nutella spread. I’ve tried using other brands of hazelnut chocolate spreads but I found for this particular use, the Nutella is thicker and works better. The other brands tended to be thinner and did not work well for a cookie sandwich. Makes about 2 dozen cookies or 12 sandwiches, depending on the size of your cutters and how thick you roll out the dough.